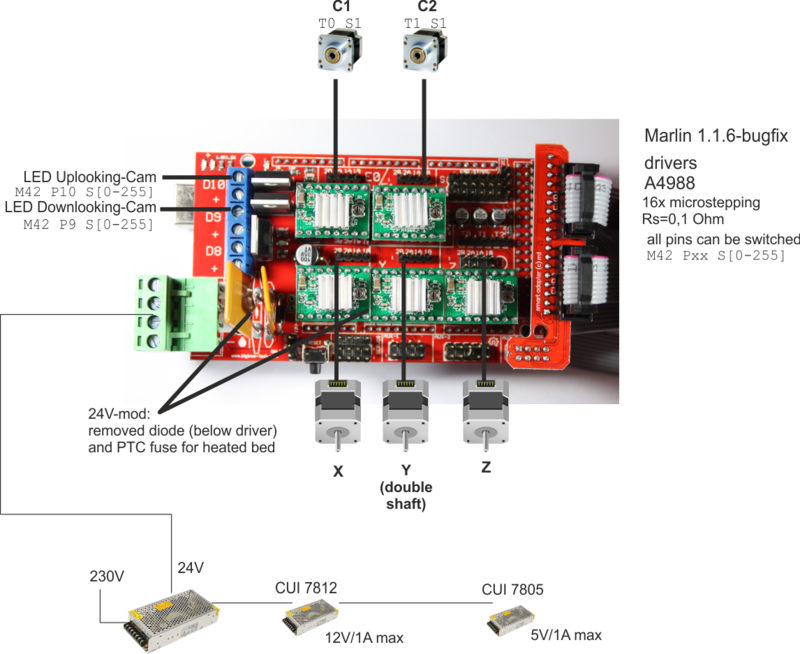 Marlin is a 5 axis controller that can run on an Arduino and is intended for 3d printer. In it's default state it is not well suited for pick and place machines because several functions like temperature control useful for 3d printers interfere. Nevertheless if configured properly, the firmware can be a good and favorable choice in combination with a ramps 1.4 board + A4988 stepper drivers. Source files of a configured marlin version running OpenPnP are located at github. That fork can be used as a template to adapt for a specific machine as the fork itself was. In OpenPnP you will need to select the org.openpnp.machine.reference.driver.GcodeDriver driver. The proposed firmware was configured for a kit including an Arduino Mega, Ramps 1.4, A4988 stepper driver and a RepRap Full Graphics Display for about 40€. Such kits are widely available at Amazon or Aliexpress. By default Ramps 1.4 is only rated for 12V, but it can easily be modded that it can handle 24V which is what most OpenPnP users use. Remove the diode D1 (it passes power to the arduino which can handle only 12v max) and the polyfuse which is rated for 16V. A detailed explanation can be found here or with google. The marlin-firmware will be specific to your machine and has to be adjusted. Most of the changes needed to work well with OpenPnP summarizes this commit. Changes were made to configuration.h, configuration_adv.h and pins_RAMPS.h. Usually digital out D8, D9, D10 would be reserved and controlled by marlin to heat extruders or the bed of a 3d printer. These pins were remapped to the unused pin 70 so that the functionality is taken off of the pins. The mosfets can now be used to turn on/off a vacuum pump, solenoids, or lights by issuing an M42 command. M851 Set offset of z-endstop limit switch.